The sixth king of the Aztecs, named Axayacatl (pronounce: ah-shah-YAH-cahtl), who ruled the Aztec Empire from 1469 to 1481, is primarily remembered for subjugating Tenochtitlan’s sister-city, Tlatelolco in 1473. In Nahuatl, the language of the Aztecs, the noun axayacatl (also appearing as axaxayacatl) literally means “Water-Face” (Pic 1). 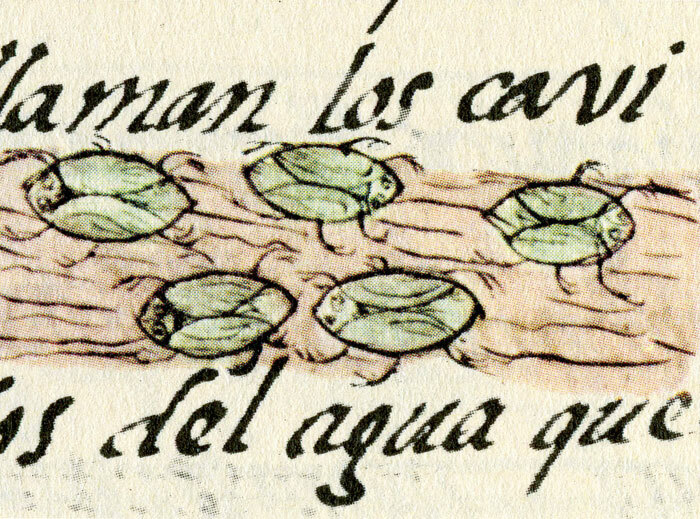 Unexpectedly, though, the term axayacatl refers not to some lofty concept or fierce animal suited to represent a king, but to a lowly water bug that the Spanish described as a “common marsh fly”, employed as food by the Aztecs. 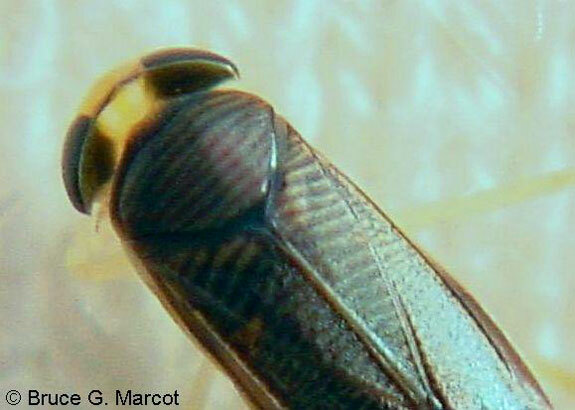 Today we know this insect as the “water-boatman” of the Family Corixidae, a plant-eating aquatic bug that can be extremely abundant in freshwater and brackish lakes. Water-boatmen scull around lakes and ponds, using their oar-like legs to dart through their watery home. The axayacatl was indeed super abundant in Lake Texcoco, the beautiful setting of the capital of the Aztec Empire, Tenochtitlan. 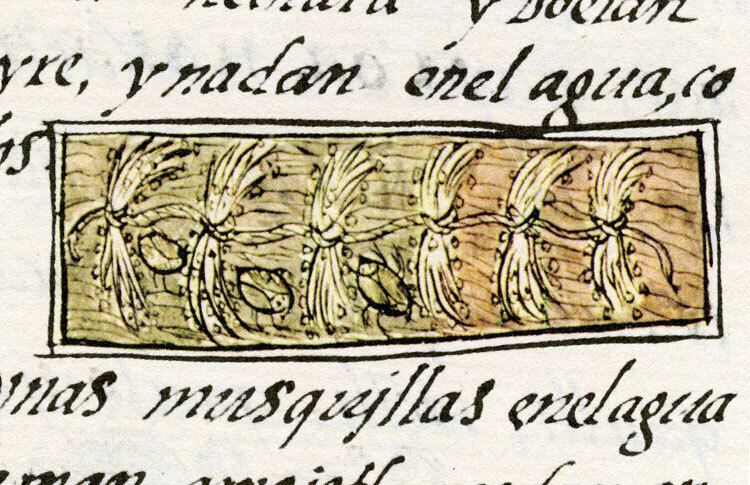 The name axayacatl has two meanings in Nahuatl: xayacatl means “face”, and xaxayacatl is a horsefly, the extra -xa- is repeated to emphasize the largeness of the horsefly’s face. Thus, axaxayacatl literally means “water-horsefly” or “horsefly of the water”, due to a similarity of appearance between horseflies and water-boatmen (especially the dome formed by the huge eyes in the front). Also, as previously mentioned, literally, axayacatl means “water-face”. A natural history work compiled soon after the Conquest tells us that the Aztecs employed the name “water-face” to refer to the water-boatman because its face was transparent and white, like a drop of water. Indeed, when we look at a picture of the head of a water-boatman (pic 2), the area between the huge eyes is see-through, like water! We know that the Aztecs ate both adult axayacatl, as well as their eggs, which they called ahuauhtli (pronounce: ah-WOW-tlee), which means literally “amaranth of the water”; amaranth is a grain made up of tiny round seeds (about the size of poppy seeds) used by the Aztecs. The adult insects were captured during certain times of the year by fishermen using large nets made of cloth. 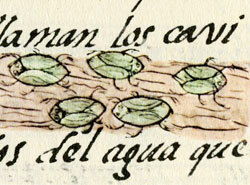 After collection, the water-boatmen were dried in the sun, ground into a dough, cooked in lime water, and then sold in the markets as cone-shaped tamales wrapped in corn husks. 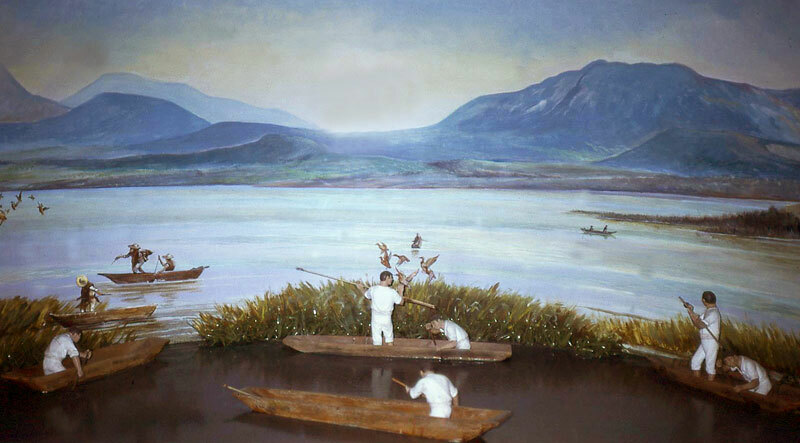 To collect the eggs, ahuauhtli “farmers” would canoe out onto Lake Texcoco and plant one end of a long rope to the mud with a stick or rock. To the free end of this rope were tied bundles of grass at regular intervals so that the bundles floated just below the surface (pic 3). The water-boatmen liked to lay their eggs in these reed bundles. After several days or weeks, the rope was hauled in, the reed bundles were sun-dried, and then the eggs were shaken off and collected. The dried eggs were formed into bricks and then sold at the market. Ahuauhtli is said to have a shrimp-like flavor, and commonly Aztec consumers cooked ahuauhtli eggs into tortillas, tamales, or mixed them with cooked bird eggs. Dried ahuauhtli could be stored for months. Ahuauhtli was a prized food source for the Aztecs, valued as much as cheese was by the Europeans; thus the Spanish called ahuauhtli “Mexican caviar”. Ahuauhtli was also used as birdseed to feed pet parrots and the birds in the royal zoo at Tenochtitlan. 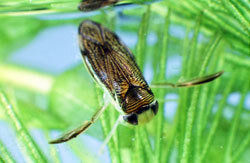 Water-boatmen and their eggs are both highly nutritious foods. Modern analysis has shown that both axayacatl and ahuauhtli are high in essential amino acids, vitamin B, iron, and protein (axayacatl: 63% protein; ahuauhtli: 57% protein). Just how abundant was the axayacatl in Aztec times? In the late 1800s, one observer estimated that Lake Texcoco, which had been partially drained and was much smaller than it was in the 1500s, contained over 3.6 trillion (12 zeroes!) water-boatmen, and that the combined weight of the adults and their eggs was about 40 million pounds, or 18,321 metric tons! It is thought that the Aztecs harvested about 3,900 metric tons (or 8.5 million pounds!) of water-boatmen and their eggs annually. Amazingly, ahuauhtli (called ahuautle or ahuahutle in modern Spanish) continued to be harvested in enormous quantities until World War II, with tons shipped yearly to various European countries for use as pet, bird or fish feed. Why would a king be named after an aquatic insect? We do not know for sure, but we can make a logical guess. The name could be a joking nickname, as such humorous names were often used by the Aztecs. 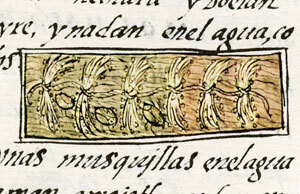 But more probably, the name was to honor a high value, esteemed food source, crucial to the success of the Aztecs. When the Aztecs first arrived in the Valley of Mexico, they were a small band, much less powerful than the established city-states already prospering in the region. The Aztecs were forced to settle in an undesirable area – a muddy island in the center of salty Lake Texcoco. Lacking abundant farm land or domestic animals for food, the resourceful Aztecs learned how to harvest the high-nutrition food stuffs from the alkaline waters of Lake Texcoco, including the super-abundant axayacatl and their eggs. Perhaps King Axayacatl was named in honor of the lowly food source that allowed the Aztecs to grow strong despite adversity, nourishing the nascent Aztec state until it blossomed into the mighty Aztec empire.